Carry-on luggage is such an important investment, but with so many choices, how do you narrow it down? We know that choosing the best carry-on luggage can definitely be a chore, but we’re here to help! Use our side-by-side comparisons to help you decide what’s important to you, and then book your next trip with confidence. Best Carry On Luggage Comparison Table - Updated for 2018! Size matters - especially if you're flying internationally. Can the kids manage it? Are wheels important to you, and how many? Be mindful of the weight. Leave that checked bag at home! Why traveling lighter is better. Many families make the mistake of assuming that they can’t get out the door for any trip without checking three bags, a stroller, a playpen, and a backpack for everyone. When we started travelling, we made the mistake of over-packing as well. The reality is much different! Learn to be more efficient, and you’ll be better off for it. These two know that checking bags is a bummer! Being organized and having a few really great pieces of carry-on luggage can make all the difference. Many hotels will provide baby gear if you ask, making it possible for you to travel without having to pack everything. While it isn’t always possible, avoiding checked luggage saves time, relieves stress at the airport, and allows you to avoid expensive baggage fees. We love it when we don’t have to check a bag! We’ve broken down several great choices of carry-on luggage in the table below. All vary in price, weight, and size slightly, but all of them will have your family travelling better in no time. Best Carry-On Luggage Comparison – Updated for 2019! Size matters – especially if you’re flying internationally. Carry-on luggage is not standard by any means. Airlines also have their own requirements when it comes to the luggage they will allow in the overhead bins on their planes. Generally, international carriers are more strict on their size requirements than U.S. airlines. If you intend to fly internationally, make sure that you favor the smaller 19 and 20 inch models over the 21 and 22 inch ones. These requirements can change at any time, so it’s always best that you check with the airline that you’re flying with to verify before you fly. We looked up the carry on restrictions for many popular airlines and put them all in one place. Click here to see them. One of the expectations that we set for the kids is that they manage their own luggage. We do this because we want them to be responsible travelers. We’re all in this together, so everyone needs to pull his or her weight – literally. Of course, this isn’t possible with younger kids and babies, but as they get older it’s a tremendous help. When we’re in a new or foreign place, we don’t want to be hassling with the kids’ luggage while we’re trying to navigate the metro or read street signs. We make sure that the luggage works well for them too, which means lots of pockets for their stuff, and smooth-rolling wheels. Good carry-on luggage makes a huge difference when travelling. Everyone wants their money to go far – that’s obvious. It’s even more true when you’re making a large purchase like luggage. The best way we’ve found to vet this out is to read reviews on places like Amazon, but also the travel forums. Many places like FlyerTalk have very active forums where travelers ask about the best types of luggage. If you’re looking for an on-the-ground report on the best carry on bag, Flyertalk is a great resource. Honestly, this could go both ways. I travel with a Red Oxx bag that is soft with no wheels and no frame. I love it because it’s able to squish into small bins even if I’ve over-packed a little bit. I can pack a week’s worth of clothes in it and be fine. It also looks deceptively small and keeps eagle-eyed gate agents from trying to gate-check it on full flights. It’s actually the same as any other – 22″ x 14″. Some travelers prefer hard-sided luggage because it offers more protection, and the rigid design makes it easier to maneuver. The internal frame and handle will take up volume in your bag meaning less room for your clothes and gear. This will be a determination that you’ll have to make on your own, but even today’s poly-carbonate will flex a bit, so it’s not a deal-breaker either way. Have luggage – will travel. Wheeled carry-on luggage comes in two different varieties – two-wheeled and four. The models with four wheels – or spinners – are able to stand upright on all four wheels and are extremely maneuverable. Drawbacks to this design are that the smaller wheels can be more fragile than other types, and your bag can roll away from you if you leave it on a slope or hill. Also keep in mind that the wheels will add a bit of overall length to the bag which could make it more difficult to fit into small places. Upright bags with only two wheels tend to stay put better and, in our experience, roll a bit better. Keep in mind however that they can fall over if over packed and aren’t quite as maneuverable. The pink Tumi bag that Carrie is pulling in the picture to the left is prone to tipping, but the blue eBags bag that Andrew has does great. I personally love my bag because it’s all canvas and that’s about it – no extra aluminum or wheels to add bulk or weight. While this is great for me, it’s not the best for kids or folks who don’t want a heavy bag hanging off their shoulder. As you’re deliberating over carry-on bags, weight matters. That’s why I’ve included this stat in the table. Even though aluminum doesn’t weigh much, weight is weight, and less is better. Looking for something smaller that fits under the seat? Check out our guide on the best underseat luggage. It's got everything you need! I’ve put this one last for a reason. I think that it’s really important to consider what you need, and buy the best that you can afford. If that means planning ahead and saving for a few months, then I think that’s smart. If you are a serious backpacker and were going to carry your entire life on your back for days or weeks, you would want something that’s going to be comfortable, durable, and last a long time. Other types of luggage are no different. Most times, you get what you pay for, so don’t skimp. Kenneth Cole has a penchant for making stylish luggage that’s also affordable, and we think that is perfect for traveling families on a budget. We wrote about its big brother – the 28″ spinner – over on our full-size suitcase post because of hundreds of solid reviews and good ratings from several sources. The carry-on version is no exception. It comes in an array of colors, and customers seem to love it. The Reaction Out of Bounds spinner is hard sided, which will keep everything inside protected, while the smart design and unique colors will have you looking good on your trip. This bag is also lightweight, and the wheels move 360 degrees, giving you freedom of movement. Reinforced corners help keep dings and scratches to a minimum. If you’re looking for style on a budget, this is your bag. Check here for the latest prices on the Kenneth Cole Reaction Out of Bounds 20″. We’ve written about the Delsey 29″ version of this bag in our suitcase comparison here. With 4.5 stars and nearly 600 reviews on Amazon, their 21″ carry-on version makes our list here as well. Delsey makes a stylish and affordable bag, and although we don’t own one, we can’t argue with its popularity. What makes Aero unique among other carry-on bags is the easy-access front compartment. Unzip to quickly stow or retrieve laptops, passports, chargers – anything that you may need quickly. This is great for TSA lines where you may need to throw a laptop or your liquids bag into a bin quickly, freeing up your hands to help the kids with their own gear. Other features of this bag include double spinner wheels, giving you good mobility, self-repairing zippers, a TSA-approved combination lock, and 2″ of expandability for when you end up with a few souvenirs on the way home. It also comes in several colors, so you don’t have to blend in with the crowd. Price, forward-thinking design, and great reviews earn the Delsey Aero a well-deserved spot on our list. Check here for the latest prices on the Delsey Helium Aero International Carry On. Just like the rest of the Maxlite 3 line, Travelpro’s 20″ international spinner gets great reviews, and with 4.5 stars and nearly 300 total reviews on Amazon, it is a great addition to our list. For years, Travelpro has been a trusted name in luggage, and the Maxlite 3 range is one of its most popular. In addition to complying with international carry-on sizes, this bag comes with a full-length front pocket for storing things that need to be accessed quickly, a lightweight honeycomb frame, and a locking handle with two positions. It’s also soft-sided, so it can squeeze into crowded overhead bins. This bag doesn’t have integrated TSA locks like some of the other bags on this list, and there is not built-in expansion, but if you are looking for a basic bag at a good price, the Maxlite 3 should work for you. Check here for the latest prices on the Travelpro Maxlite 3 International Carry On. The first thing you notice about this Samsonite is the bright colors. If you’re looking for a well-reviewed carry-on bag that adds a little pizzazz to your travel, then put this bag on your list. If Caribbean Blue isn’t quite your style, this bag also comes in more traditional silver and black. The Samsonite Omni’s big brother made our list for full-size suitcases because of its popularity and value, and this bag is no different. The price is right, and will get the job done. It is hard-sided, making it a little more resistant to squishing and knocking around, and Samsonite’s ‘micro-diamond texture’ helps keep it looking good and resistant to scratches. At 6.8 pounds, it’s fairly lightweight and at 19″, you know your bag will fit in the bin, even on international carriers. TSA locks and a zippered expansion strip round out the features on this solid bag. Check here for the latest prices on the Samsonite Omni 20″ Spinner. This international carry-on from Victorinox is full of smart features and carries one of the best warranties out there. Part of the appeal of the Werks 5.0 line from Victorinox is that it is covered by their Global Lifetime Plus Limited Warranty that even includes abuse by airlines and other travel carriers for the first six years of ownership. Read about their policy here. The Werks traveler 5.0 handle has three locking positions which is great for travelers of all heights and prevents heel-knocking for taller travelers. An easy-access front pocket is perfect for holding a laptop, and their Pack More system internally will help you stay organized. 360-degree casters make this bag super mobile, and an included attach-a-bag strap allows you to tether another bag on top for easy mobility through the airport. At 20″, The Werks Traveler 5.0 trolley will meet strict international carry-on requirements, and the workmanship and warranty will keep you travelling for a long time. If you prefer the upright version of this bag (non-spinner), you can check the latest prices here. Check here for the latest prices on the Victorinox Werks Traveler 5.0 20″ Spinner. We can’t say enough good things about the eBags Mother Lode Mini, and it easily makes our list again for 2019. This is the bag our kids use and we all love it! First of all, it’s a great size. It’s skinny enough to fit into all the overhead bins we’ve ever encountered, but it also expands to accommodate the extra souvenir or two when we come home from vacation. Secondly, the wheels on these bags are easy to roll. They are more like wheels you would find on inline skates than cheap plastic wheels on some other luggage. They don’t get caught up, and the rubber makes them easy on any terrain. The interior of these bags is nice and bright with lots of compartments to pack and separate items. When paired with a set of eBags ultra-light packing cubes and the eBags Professional Slim Junior Laptop Backpack (that fits right over the handle), it’s an elegant and unbeatable luggage solution that every travelling family should take a look at. Even when stacked with a backpack, they don’t tip over, which if you travel with kids, that’s always a problem. Problem solved. Check here for the latest prices on the eBags TLS Mother Lode Mini 21″ Wheeled Duffel. The Briggs & Riley Torq collection is for those who need a bag that can take on anything, including whatever the airline baggage handlers can throw at it. It’s one of the high-end options on this list, but for good reason – it’s backed by the Briggs & Riley “simple as that® guarantee“. Their bags are guaranteed for life, even if the airline destroys it, and they will repair it free of charge. It’s why we invested in one ourselves. We own the larger Baseline series 28″ spinner and love it. The Torq is unique because it has a lockable “case” in the front for storing a laptop or tablet. This added protection is perfect for road warriors who need easy access to their work. At 21″, this bag won’t have any problems fitting in the overhead bins, and the molded grab points and recessed spinner wheels make it easy to maneuver. Other smart features are the wide wheelbase (harder to tip), 80/20 lid opening (making it easier to pack like a traditional suitcase), and molded side feet that prevent scratches when sitting on its side. Molded soft-touch handles on the top and side, and TSA locks round out this awesome bag. This bag is heavier than most, but it’s built like a tank. If you’re looking for all the bells and whistles and want the best warranty in the business, look no further. Check here for the latest prices on the Briggs & Riley Torq International Carry On. The Travelpro Maxlite 4 series improves upon the Maxlite 3 in one important area – weight. At a mere 5.9 pounds, the Maxlite 4 is very lightweight but still manages to be durable thanks to the honeycomb frame and the EVA foam construction. It is also slightly larger, so if you’re looking for an international carry-on, you may want to look elsewhere as 19″-20″ is the max with many airlines. Features include a telescoping handle with 2 lock positions, water-resistant polyester, comfortable grip, and 360-degree spinner wheels. It also comes in a variety of colors and Travelpro’s limited lifetime warranty. If weight is a concern, then take a look and the Travelpro Maxlite 4. 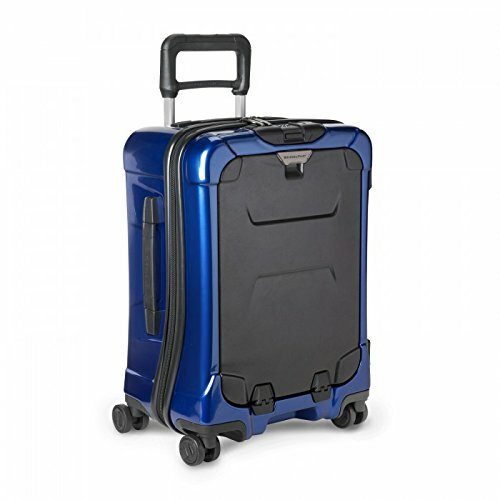 Check here for the latest prices on the Travelpro Maxlite 4 21″ Spinner. While we don’t own this particular bag, we own it’s bigger brother, and it’s a great bag. Make no mistake – Briggs & Riley are not cheap. They are an investment. One of the the reasons is their warranty. They are one of the few luggage manufacturers left that have an unconditional warranty. It even covers damage by the airline. This is the peace of mind we needed when we bought ours. We’re able to just take our bag in to any dealer, and they will take it from there. See for yourself. Awesome! We have found that BR luggage is extremely well made, easy to roll and spin, easy to pack and unpack, and is generally smart in every way. If you prefer the upright version of this bag instead of the spinner, click here for the latest prices. Check here for the latest prices on the Briggs & Riley Baseline International Carry On Spinner. The Air Boss by Red Oxx is the bag I personally carry, and I can’t say enough good things about it. I love that it’s made in the U.S.A. (Montana), is guaranteed for life, and is tough as nails. It’s made of heavy-gauge nylon, has a smart design, and is purpose-built to be efficient. At 3.9 lbs., it’s super light. Dimensions are 22 x 14. It goes with me everywhere – business trips, camping trips, and even places like Peru and Japan. The Air Boss is literally a carry-on bag. It has no wheels, handles, or hardware. When fully packed, it can get quite heavy, although the strap is comfortable and doesn’t slip off your shoulder. This bag was designed in conjunction with Doug Dyment of OneBag.com and works great with the bundle packing method. While this bag won’t wow you with pockets, cubbies, and fleece-lined sleeves, it delivers on simplicity, and that goes a long way in my book. With kids in tow, I need all the simplicity I can get. Red Oxx really did think of everything with this one. New on our list this year is the Aeronaut 45L from Tom Binh. My sister travels internationally with this bag, and here is what she has to say about it. “The Tom Bihn Aeronaut 45L is a great choice if you want versatility. This bag, which is also available in a smaller 30L version, is a soft-sided duffel with a magic trick; it easily converts into a backpack. With three main compartments and many packing cube and accessory options available, the ways to pack this bag are endless. Anytime we can have a little fun, we’re all for it. These Star Wars bags from American Tourister are just the thing. For those with whom the Force is strong or who have kids that are Star Wars fans, then American Tourister has your bag. They’ve put together a collection of fun Star Wars themed luggage in different sizes based on several of your favorite characters in the Star Wars universe – perfect for taking to the opening of Star Wars: Galaxy’s Edge next year at Walt Disney World Resort. Normally, we would dismiss these for being just a fad or not being great quality, but they get great reviews on Amazon, and well, they’re just fun! At less than 7 pounds, they are fairly lightweight, have 4-wheel spinners, and the usual features on the inside like nylon lining and dividers for keeping things tidy. There are even added touches like Star Wars branded zipper pulls and logos on the inside. These bags aren’t for everyone of course, but we say if you’re not having fun, you’re doing it wrong! Pick your favorite character (or your kids’) and go with it. They’ll be the talk of the airplane rolling these things down the aisle! Check the latest prices on the American Tourister 21″ Star Wars Carry On bag. Check out the entire Star Wars collection from American Tourister. We love packing cubes and they make our trips so much easier, especially when we get spread out at the hotel. We each get our own color, and we’re sure to pack a few extras so that we have a place to put dirty clothes and keep them separate. Compare them below, and pick up a few for your next trip! While not an exhaustive list, we hope we’ve given you some ideas on what to look for in good carry on luggage. Be sure to follow us on Pinterest for other great guides and travel inspiration! Drop us a line if you have any questions, or let us know in the comments what carry-on bag you travel with.